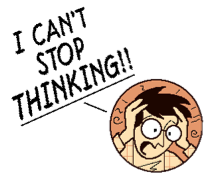 #2 – DOCTORS AND LAWYERS: SURVIVAL! 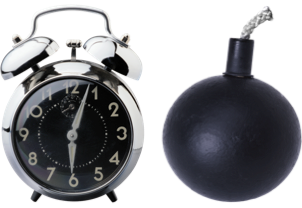 Are You a Ticking Time Bomb? Q: What’s the difference between actors and psychotics? A: Actors step out of character at the end of the play. Psychotics can’t leave the role. By that metric, what’s the difference between some lawyers and doctors and psychotics? Suicide rate among male physicians: 1.5 times higher than general population; highest among the professions. Substance addiction among physicians: about 10-15%, similar to the general population. Certain specialties (e.g., anesthesia) have higher rates. Rate of alcoholism among lawyers: between 15-24%, compared to about 10% in general population. Actors learn to play in “given circumstances” – context. You can’t play an action from a play other than the one you’re in now. When the play ends, actors “molt” the character they’ve just played by removing makeup/costume. This ritual separates PROFESSIONAL from personal persona, character from actor. The PROFESSIONAL MASK/PERSONA (upper case) is powerful, seductive, comfortable to stay in. But if you wear it home, you’re staying in character when the play’s over, playing in the wrong context. Stressful. Crazy-making. Yes, it can be hard to switch to the personal mask/persona (lower case) when you go off-duty. But actors do it every day. Doctors and lawyers can learn this transferable skill. Performing Your Profession culminates in separating PROFESSIONAL and personal masks, learning to play in the play you’re in, not the one you were in before. 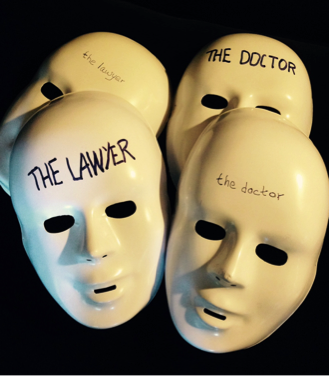 Leave THE LAWYER and THE DOCTOR masks at work. Put back the lawyer and the doctor masks when you leave the office. Defuse the bomb. #1 – Lawyers & Doctors: Are You in Your Right Mind? How’s your job performance? Think it’s good? Keep up with the literature. Have a well-developed Left Brain. Have high “EI” – emotional intelligence? 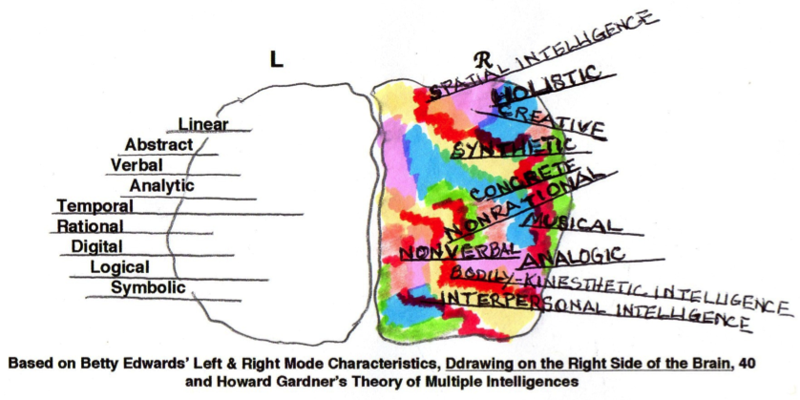 Interpersonal intelligence? Empathy? Really hear what clients & patients are saying? “Get” the sub-text? “Get” the body language? Use all your senses all the time to take in & give out information – including feeling, smelling, even tasting? Regularly come up with fresh approaches? Feel physically comfortable on the job? Feel weighed down by work at the end of the day? Have an equally well-developed Right Brain? If you answered “no” to any of those questions, let your Right Brain out of captivity. Professional schools pound domain-specific data into your Left Brain. You’ve been trained from the neck up, on one side. Mentally, you probably limp. You’re not in your Right Mind. Here’s the thing about the Left Brain: If you use the same data collection in your left brain to solve all problems, you’ll get the same answers you’ve always gotten. Theatre artists know how to use their Right Brains. They cultivate myriad skills. They use their whole body. They create. Doctors and lawyers need those same skills and creative ability for optimal professional performance! Lawyers and doctors can learn to practice the art as well as the science of their professions. 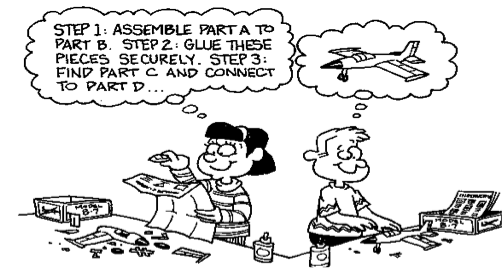 They can learn how to be complete professionals. Performing Your Profession is a systematic method I’ve developed specifically to meet the needs of doctors and lawyers. It uses a particular sequence of theatre techniques and begins by teaching you how to liberate your neglected, muzzled Right Brain. It teaches how to find fresh solutions, improve interpersonal relations. Avoid burnout. Optimize professional performance. Over years as a college theatre professor/director, I’ve seen these techniques work for actors. The skills are transferrable to doctors and lawyers: same skills, changed emphases, different goals. So… Get your Right Brain out of cold storage for exceptional professional performance. Helpful Hint: One of my standard exercises to start opening the Right Brain is to study your own hand for about 5 minutes (Set your alarm! Don’t cheat & look at the time! Stay with it. ): its lines, its movement, its feel, its sensations, its smell. Its taste. What kinds of sounds can it make? If it moves, follow it. I like this because it calls your whole body and all your senses into play as it sharpens your focus. Like playing guitar or tennis, the more you practice, the better you become. It works. Try it. Get in your Right Mind. Your work will be brighter today, even from one exercise.